Flapjacks in the U.K. are made out of oats, syrup, brown sugar, and butter — and they're delicious. Flapjacks were thought to be around right at the beginning of the 17th Century, but similar to a flan, not the tray-bake we know them as. The cooking method is very similar for most recipes; melt the fat and stir in the oats. For more information, click here, or view one of our many flapjack recipes below. Birthday Recipes - Includes finger food, mini pizzas, party favourites and delicious birthday cakes with various icings. Blackberry Recipes - Also known as the brambleberry. Carrot Recipes - One of the finest collections of uses for these orange vegetables in the world. Christmas Recipes - Festive foodstuffs for the family. Coffee Recipes - Different ways to enjoy this hot drink. Donut Recipes - Donuts tend to come in one of two varieties: ring donuts coated with sugar or an icing glaze or filled donuts injected with jam, custard or a sweetened, thickened cream. Onion Recipes - One of the most commonly used veggies in the world. Pear Recipes - Ways to poach, roast, chutney and even use pears in ice cream. Quail Recipes - Small, plump game birds. Scone Recipes - Delicious sweet or savoury quickbread snack. Sweetcorn Recipes - Some of the very finest methods for cooking corn. Venison Recipes - Lower in fat than many other alternatives, deer meat is both delicious and healthy. Shakespeare actually referred to the flapjack in one of his plays, Pericles, Prince of Tyre, suggesting it was a common British dessert of the time. After that, the term ‘flapjack’ was used to describe something similar to apple flan. 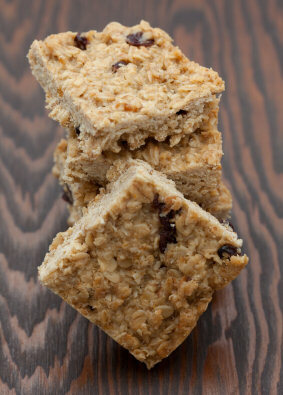 It wasn’t until 1935 that the flapjack became something made out of rolled oats. The humble flapjack is known as many different things — a pancake in America, ‘Hudson Bay Bread’ in North America, and ‘a slice’ or a ‘muesli bar’ in Australia. They come in many forms, and many flavours — fruity, chocolate, low fat, full fat, plain — so many to choose from, so little time! Flapjack is also a term used to describe a wrestling move — also known as a pancake move, presumably to describe the flattening effect the move has on the wrestler’s opponent! FlapjackRecipes.co.uk uses measurements and ingredients for the United Kingdom. If you are located elsewhere in the world, you may find PancakeRecipes.net makes more sense to you!